Why Do Healthy People Die with No Warning from A Heart Attack? Why Do Sick People Die with No Warning from A Heart? Would you like to Know how your diet is affecting your arteries? Nitric Oxide Deficiencies: When nitric oxide levels are deficient, blood vessels lose their elasticity and develop plaque, which leads to inflammation and weakened tissue. This puts more strain on the heart and creates a susceptibility to cardiovascular problems. There's a reason that the research revealing nitric oxide's benefits won the Nobel Prize - it lays the groundwork for improving and sustaining cardiovascular health and cellular environment health. Know your waveform pattern and see if you are at risk for the number 1 and number 2 killers of Americans Heart Disease and Cancer. Family, you can be a raw eater, a vegan, a meat eater, you can be a couch potato you can be a world-class athlete. You can maintain the correct weight, or you can be overweight, You can look physically fit, and you can look out of shape, and you can be 18 to 120 years old, and your waveform pattern should be a level one and no lower than a level two for optimal well-being. You know your blood test scores now learn your waveform pattern and stay ahead of the life cycle. See if you are moving towards the tree of death/knowledge or the tree of life/inner wisdom. 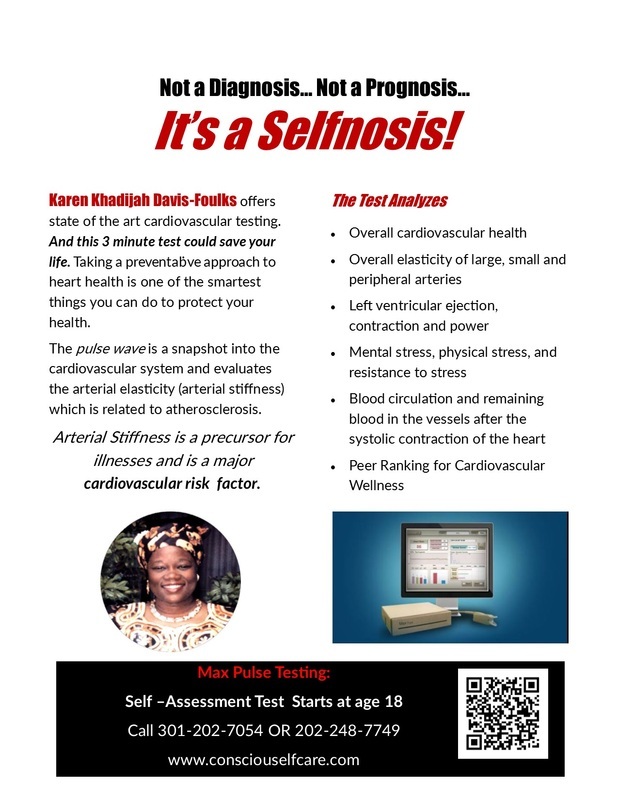 Schedule your clients, students, partners, family, friends, community, group, organization, and social group for the "Selfnosis" Cardiovascular Self-Assurance View/test today. The Max Pulse utilizes pulse wave analysis technology. The blood's pulse wave is followed from the time it leaves the heart and travels through the blood vessels down the finger. 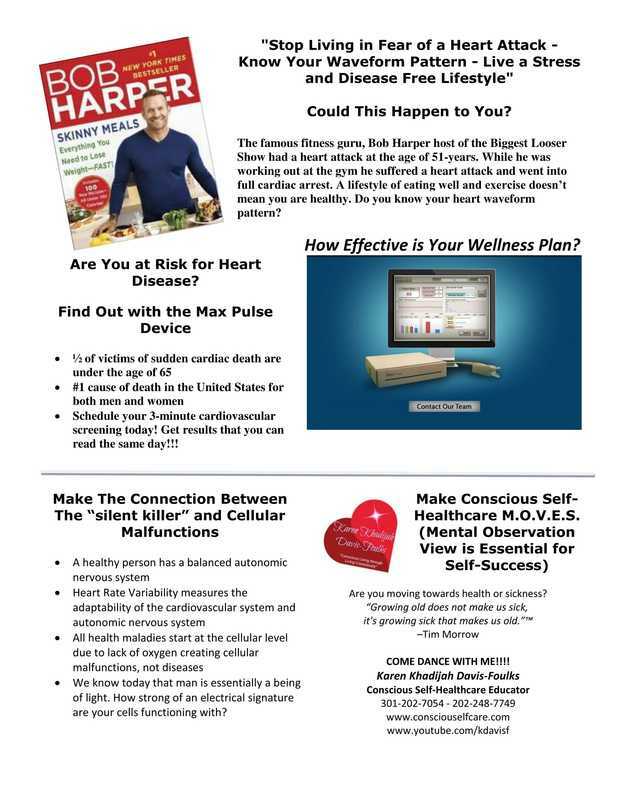 We suggest that you schedule the Max Pulse test every 90 days for self-evaluation check up on your cardiovascular and autonomic nervous system. Call to schedule your 30-minute session. Payment accepted at office visit appointment. Call for details 202-248-7749. The call is returned within 24 hours; please leave a message in reference to the "Selfnosis View" Test. How well is your medication doing to support your heart, cardiovascular/circulatory system with maintaining wellness? How well are your supplements, diet, and lifestyle choices doing to support your wellness? Schedule your Max Pulse session today. Receive a recommended wellness plan free with waveform pattern of four (4) or higher. Two 4 Heart Wellness "Selfnosis" Holistic Energetic Practitioner Campaign. ​Schedule 10 people for the Max Pulse Cardiovascular and Autonomic Nervous System Self-Assessment Session and receive your session for FREE. Earn additional income on every person you schedule. You receive the print out and you have the discussion with your clients. ​Schedule 10 people for the Max Pulse Cardiovascular and Autonomic Nervous System Self-Assessment Session and receive your session for FREE. Earn additional income on every person you schedule.